Witney Vikings Youth marked the official arrival at their new home ground by making their presence was well known at the recent Burwell Meadow Field Day. Organising a number drills and relaxed matches on one of our 7-a-side pitches, the Vikings team of club officials and coaches worked alongside the Oxfordshire FA Tesco Skills team to provide bags of “fun through football” for all ages throughout the day. 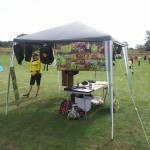 In addition to physical activities the Vikings stall displayed a selection of team and individual action photos alongside club merchandise and information about our club via newsletter and flyers and recorded a good number of new player interest, especially in our highly sucessfull academy system. All merchanise should be available via our club shop from 7th Sept btw. A big thank you to Witney Town Council for accomodating us so well – we look forward to our continued collaboration for many years to come. Thank you to Kevin Lloyd and his team of coaches – we look forward to working together again very very soon, and thank you also to all those who came to support us. Well done to all Vikings involved…..the futures bright…..the futures yellow!